Rector of the Lazarski University in Warsaw and Head of the Department of Quantitative Methods in Economic Sciences. She is a Professor in Economic Sciences and an expert in demographics. 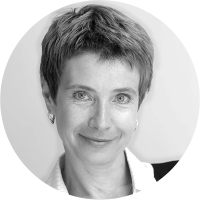 She is the author of over 100 academic papers on demographics and migration, published by prestigious publishing houses in Poland, the UK and the USA. She was awarded the Knight Cross of the Order of Polonia Restituta by the Polish President in November 2015 for her outstanding research and educational achievements and for her contribution to promoting Polish research in the world.